I don’t know what I think sometimes. I’ve gone to Brown’s (located at 417 River Street in Troy, NY) and places like it, and I get cute when I order. I partially blame the menu, which features a number of cute entrées, but I can’t fully because nobody places my order but me. Every time I have gone, I’ve either ordered one of these entrées or just an appetizer, and I’ve been disappointed. I like the Whiskey Porter, so that’s what I ordered for this trip. 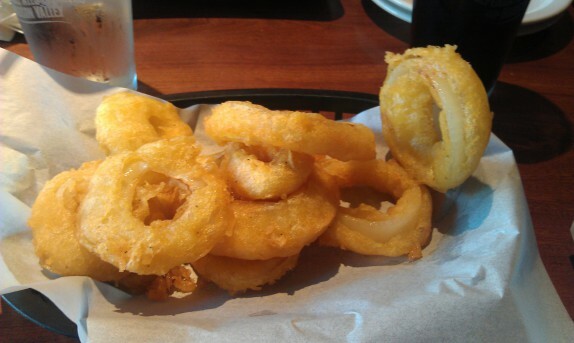 There are days where I need my onion ring fix. Mentally, I have myself programmed to not worry about my diet if I eat onion rings every few weeks. Browns has an appetizer consisting of beer battered (their tomahawk pilsner) onion rings, so I had to order that. To guild the Lilly, I decided to not be cute this time and order a burger. I have gotten a number of recommendations about how great the burgers are. I decided on the Old Hickory Burger [“Deliciously smoky, covered with bacon, cheddar jack cheese and smothered in our Cherry Raspberry Ale BBQ Sauce”]; that’s my type of burger out of the list on the menu. So that’s what I got (no fries, but I did get cole slaw). My beer was just as I like it. 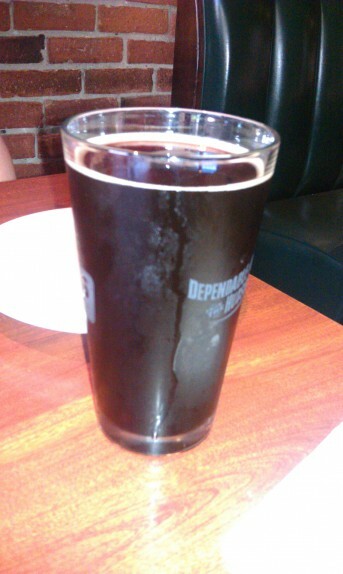 Thick porter, complex in flavor, further complicated in flavor by living in whiskey barrels for a short period of time. It’s not a super-high alcohol beer. In my opinion, it is far and away the best beer I’ve had at Browns. The onion rings were somewhat disappointing on this trip. Onion rings are a tough food to nail, and everything is there for these to have tasted great. I just feel like they were a little soggy and spongy this time around. Could have been extra moist onions or not enough time in the fryer. The burger was alright. I really liked the cheddar cheese and the cherry raspberry ale BBQ sauce. The burger came out fairly well-done, even though I asked for medium. Fine, most places aren’t going to give you an undercooked burger nowadays; I’m moving past that. The bun left a lot to be desired. 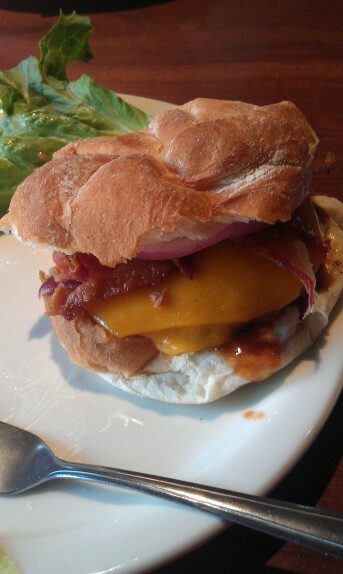 It was a weird hybrid between a picnic hamburger bun and a hard roll, texturally. It didn’t really hold up well against the burger and BBQ sauce. I’m nitpicking. Let me be more general. It was average. It wasn’t terrible; It wasn’t the greatest thing on the planet; I’d order it again. I’ll put it another way: it’s better than any entrée I’ve ordered there. Brown’s is a pub that represents Troy rather nicely. At the heart of it, it’s a great place to get together with some people, belly up to the bar and have some microbrews, sit at the patio with some brewskies, and/or munch on some not-great-for-you foods until your heart’s content. Nah, it’s just their rings. They’re always that way, and it’s disappointing. I can develop personalized exercise and eating plans modeled around your schedule, physical limitations, and goals. Disclaimer: The opinions expressed are those of the authors and do not necessarily state or reflect the views of any company, organization, or affiliation to which the authors belong to or represent.